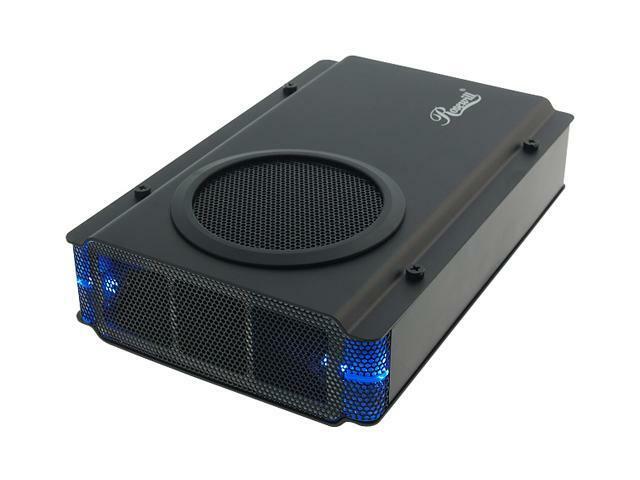 - Use any sata 3.5" internal hard drive, has usb 2.0 and esata connections, comes with all the cables including an esata back plate. - Nice ventilation and grills. 80mm fan is pretty quiet though audible. There is a separate power switch just for the fan if you want to turn that off. - Fit and finish was good. It could use some rubber feet or a stand. Assembly was pretty easy. - Bright Blue LED for power on the left and another on the right for drive activity. - I've read it spins down if not in use but I think that works only on esata. On USB (how I have it hooked it) it doesn't seem to ever go to sleep. I've also read that it should not interfere with suspend/hibernation modes on the PC though I haven't tested this since it's on my 24/7 server. - There are two reports that it works with the SA 8300 DVR though I personally did not try it. I'm using it for backups. Highly recommended. Good price considering the features and the fan.